Music features high on the line up of shows at the Epsom Playhouse this April. Prepare for a nostalgia party extravaganza as the legendary That'll Be The Day returns to the Epsom Playhouse on Thursday 7 April with another opportunity to see the 30th Anniversary Special The nations favourite rock 'n' roll variety spectacular features a fantastic line up of knock-out hits from the ‘50s, ‘60s and ‘70s, plus more side-splitting comedy! Early booking is advised as this ever-popular show attracts a big audience of music lovers ready to party. Whitney The Queen of the Night is a stunning celebration of the music and life of one of the greatest singers of our time at the Epsom Playhouse on Friday 8 April. This award winning production features a stellar line-up with rising West End star, Rebecca Freckleton delivering a powerhouse and breath-taking performance as Whitney. This is an emotional rollercoaster ride through three decades of classic hits remembering the most highly awarded female artiste in the world ever. Up On The Roof on Saturday 9 April the Epsom Playhouse celebrates two legendary singer/ songwriters Carole King and James Taylor who collaborated on many hit songs through the 1970s and had their works covered by other great singers. With hits such as Up on the Roof, You Make Me Feel (Like a Natural Woman), Handyman and You've Got a Friend, enjoy these fantastic songs performed by Brian Dale and Emma Pryde plus a live six piece band and show reel images. 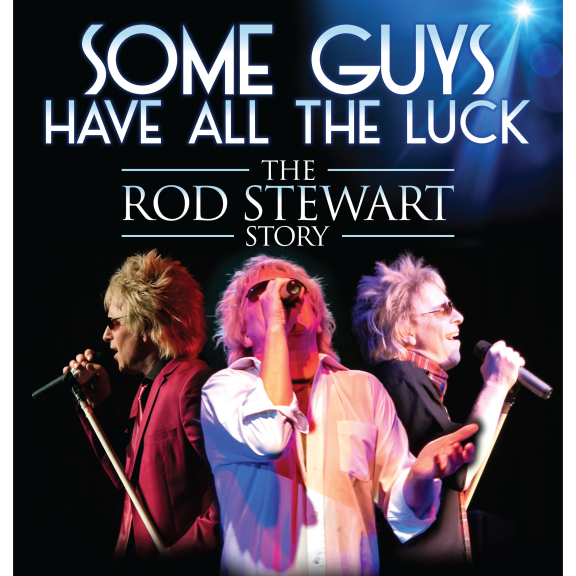 Some Guys Have All The Luck is a brand new theatrical production on at the Epsom Playhouse on Wednesday 20 April celebrating the career of Rod Stewart one of rocks greatest icons from street busker through to international superstar. Paul Metcalfe delivers an authentic and charismatic performance assuming the persona of this legend right down to the last detail from the distinctive vocals to the swaggering showmanship and sheer fun that have made Rod Stewart one of the most loved performers of all time. Back by popular demand The Magnificent Music Hall Matinee on Thursday 21 April is a chance to step back in time to the glorious and glamorous heyday of British Music Hall around the golden era of the1890s. At the helm of this afternoon of song dance, magic and laughter will be the eloquent and elegantly waistcoated Chairman complete with gavel and sharp wit. He will introduce a great line up of artistes who have all appeared on the BBC's The Good Old Days. Tickets for all these shows are on sale now by going to the website www.epsomplayhouse.co.uk or by ringing the Box Office on 01372 742555/742227.